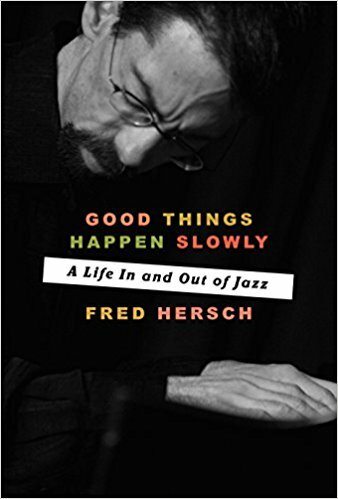 More than most of us, Fred Hersch grew up feeling he didn’t fit in. This extreme awkwardness had two main causes. One was that from an early age he was more interested in music than the more typical childhood pursuits. The other was the realization that he was gay. This recently published memoir articulates Fred’s struggles and triumphs as a person inhabiting both the jazz and the gay worlds. Although at age 62 he still undoubtedly has much more to contribute, his story to this point is well worth the read. The music/jazz world was relatively easy for him to sort out. His family was musical, he found a variety of role models—teachers, mentors, other players. He basically knew what to do and he was very good at it, so he could act confidently, even aggressively, to further his ambitions. The gay world was pretty much the opposite. He didn’t really know anyone who was part of it, had almost no information about it. And he worried that identification with that world would negatively impact his advancement in the other. After a brief stop at Grinnell College, Fred ended up at the New England Conservatory. In-depth investigation of the jazz world followed, both formally at NEC and informally in the Boston jazz scene. It’s here that he also took his first fitful steps to become a member of the gay world. Then on to New York, where he found work as a sideman, played with and learned from some of the previous generation’s greats, and began to develop his own style both in a trio and as a soloist. He received his first significant review—a flattering mention in The New Yorker--and spent countless hours playing and listening to jazz. He began to record, and became more serious about composing. And then came AIDS. Upon arriving in New York Fred became more active as a gay man and had his first experience of real love. But he was very careful to hide his sexual orientation, particularly from the jazz world. Though he realized that this deception was not healthy and limited his ability to express himself musically, he was just not willing to risk coming out. As AIDS devastated the gay community and he himself was diagnosed as HIV-positive, Fred became desperate and compulsive, in his music as well as in his personal life. Though he was during this period incredibly productive as a jazz player and composer, and was able to manage his illness with the therapies available at the time, eventually it all caught up with him and he ended up in a coma. For almost two months he was in a third world with little likelihood of returning. But eventually he did, and after an amazing effort to rehabilitate himself, he was able get back to jazz, better than ever. Now he could express himself completely, without deception or restraint. He finally knew for sure who he was—he could be himself and express his full range of creativity and emotion.